Stressbusters NYC - Massage therapy that will save the day! To relax and calm people in the New York City Region. ​By giving professional on-site chair massages in offices, special events and arenas around the New York City metropolis. Therapists. Our superheroes are a diverse team of caped crusaders (capes optional) with unique superpowers. Stressbusters are also known as “The Fatigue Relief Team”. Learn about our team. made up of experienced, strong and personable massage therapists. Boosting morale in the workplace! 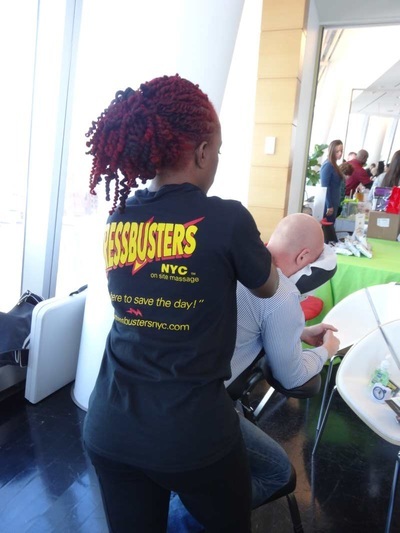 ​"We had hired massage therapists from other companies for employee appreciation day and regular massages but were never completely satisfied until we hired Stressbusters NYC. What a difference! Their therapists were experienced, strong and really listened to our employees needs tailoring the massages specifically to them. We have been with Stressbusters NYC ever since and purchased a large package for series of massages throughout the next year. Thank you Stressbusters NYC!" "I love working for Stressbusters NYC. This is the first chair massage company I have worked for that has paid me fairly according to my expertise and experience. (I’ve been a LMT for nearly 11 years and have loyal private clients). I’m happy that this company is run by a LMT and Personal Trainer who appreciate my work. I won’t work for any other chair massage company." 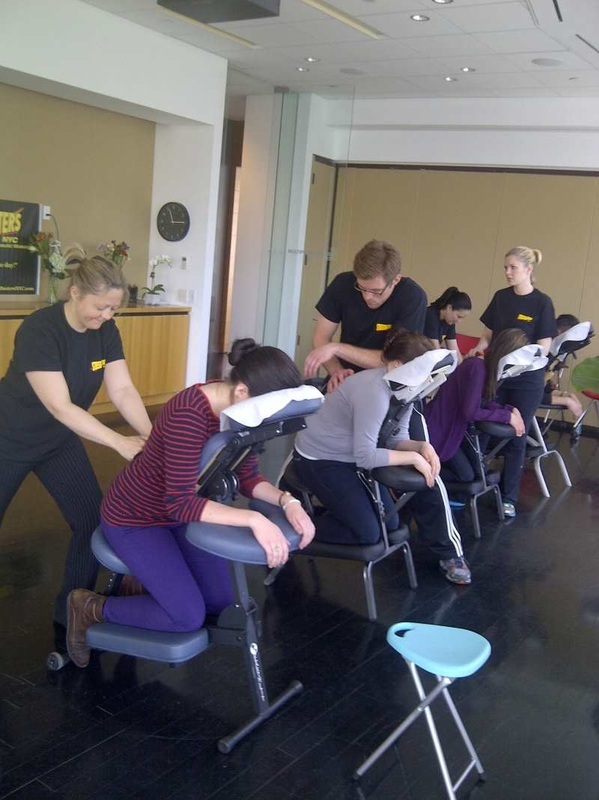 "We needed table massages for our stressed talent and executives while shooting long hours of an intense film promo. We couldn’t have been happier with Stressbusters NYC. They were organized, professional and BEST OF ALL each therapist had good hands! They revitalized us! We will definitely use them again!" "Stressbusters NYC was very professional. Everyone had a wonderful chair massage! We would definitely recommend them." "Finally - a company that doesn’t underpay their LMTs. The clients must realize that they get what they pay for. 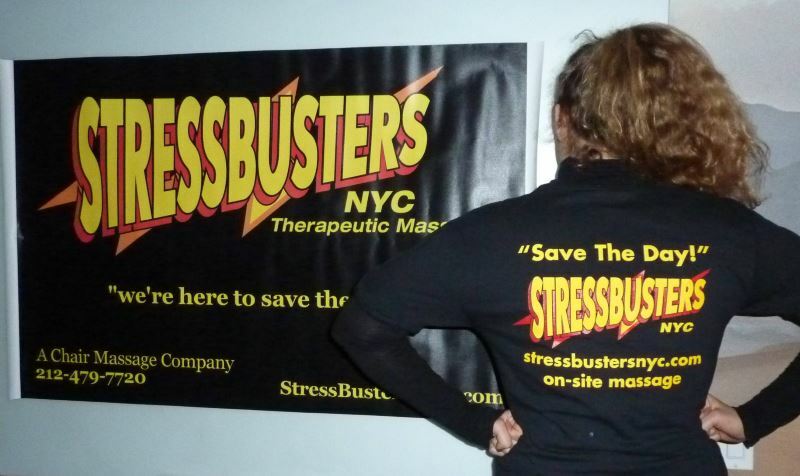 If you want quality massages with great therapists AND reasonable prices, Stressbusters NYC is the way to go."